You can enjoy the practicality of Graber’s LightWeaves Roller and Solar Shades without having to sacrifice style. The entire collection offers an array of attractive jacquards, stripes and woven textures that can look rustic, refined, or anywhere in between. With decorative options like valances, cornices and scallops, every window in your home can be a form of creative expression. Custom Drapery Panels on the side of the windows add a finishing touch to Roller Shades and can be made with black out lining for bedrooms to block the light gaps on the sides of Roller Shades. Select from thousands of fabrics at Sheila’s Window Toppers and we will create a beautiful room for you! Graber LightWeaves Roller Shades offer a variety of light control options, from sheer to blackout. 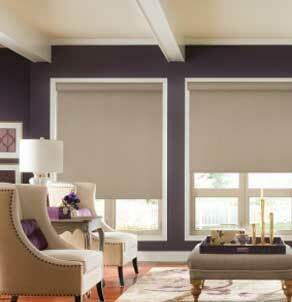 This light control capability makes these shades an ideal choice in any room. LightWeaves Roller Shades are available in a wide selection of beautiful jacquards and woven textures to match any casual or contemporary décor. Complete the look of your Roller Shades with decorative options that include valances, cornices, scallops, trims, braids and fringe. Solar Shades allow you a view to the outside during the daytime, but the view is the opposite at night when the lights are on in your home. Learn more about Design Rollers. Dual Shades make it easy to create versatile light control and privacy levels for any interior. 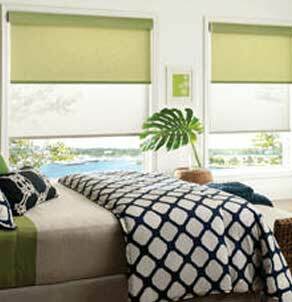 The innovatitive design of Graber Dual Shades integrates two fabrics from our Solar and/or Roller collections, either of which can be lowered or raised. For example, pull down a Solar Shade during the day to lower temperature and glare while maintaining your view to the outside. Pull down a Roller Shade at night to protect your privacy. Graber LightWeaves Solar Shades are an ideal choice for anyone who wants to maintain their view to the outside while reducing heat transmittance to keep their interior cool and comfortable. They also block UV rays to help protect your interior from damage and minimize glare on TV screens and computers. Many of the solar fabrics are also available in Graber Panel Accents Sliding Panels for a coordinated look throughout your home.